Get into the spirit of Easter at the Market and join us for a great schedule of events with a little bit of something for everyone! For Kitchen inspiration, we’ve got Chef Tobie Puttock taking to the stage, with some demonstrations on Sat 13 April in our Omega Neil Perry Demonstration Kitchen and sharing some favourite seasonal recipes (and a few tastings if you’re lucky!). Our Traders are taking to the stage too on Sunday 14 April, with Ash from Claringbolds sharing a Good Friday Seafood favourite, Chad from Pete n Rosie’s Deli talking Easter taste sensations with Goats Cheese, Dina from Chasos showing how traditional Greek egg dying is done, Jon from Hagens Organics showing how to bone out a leg of lamb for your Easter feasting, and Kathy Tsaples from Sweet Greek sharing some of her Greek Easter favourites! 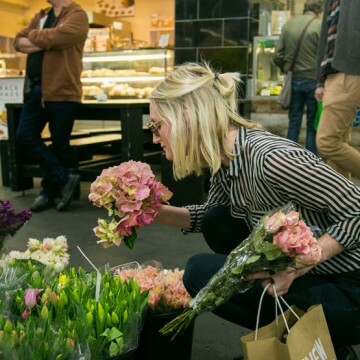 Christina from Prahran Garden Centre is holding two special Easter Kokedama & Terrarium making Workshops – with the chance to make yourself something lovely to give or to keep. Why not book with a friend and make a day of it! Contact Prahran Garden Centre for details and bookings. There’ll be plenty to keep the little ones entertained too during the month, with Free Easter Face Painting, the chance to have a cuddle with the bunnies at the Peninsula Animal Farm and live entertainment in Market Square on the weekends. Don’t miss our special Easter crafting session for the kids! We’re teaming up with Zero Waste Victoria, who will be taking over the Omega Neil Perry Kitchen to run a sustainable and crafty workshop involving natural food crafts. This will be a FREE ticketed event, running for about an hour – held on Friday 12th April. Click here for tickets. This year we’ll also be welcoming volunteers from Very Special Kids, who’ll be joining us at the Market on Sunday 14th from 10 – 2pm. All funds raised will go towards providing care for children with life-threatening conditions, so don’t forget to pop by their stand for more info and to donate. Oh, and the Easter Bunny will be here too, hopping ’round to pay us a visit on Sunday 14th and Saturday 20th, April. And of course, all around the Market we will have special Easter Eats and Treats to get your appetite going (Hot Buttery Hot Cross Bun Bar anyone?). Have a taste of more over here. Keep an eye out here for more updates and don’t forget to tag us in your social posts, and mention #Easter2019 and #AutumnHarvest too. We’ll be updating our events app next week with more. Easter 2019 Activity Schedule – Please check back for updates. Easter 2019 Cooking Demonstration Schedule – Please check back for updates.